Vreid's previous album, 2011's V, wasn't very well received in parts MetalReviews, chiefly due to the shift towards a new, meandering, longwindedly progressive sound. One comment at the time was that it sounded like a failed attempt to ape Enslaved, which I think is a bit unkind - it was far less ethereal and far more thrashy than the Viking legends tend to be. 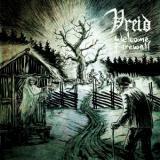 Yet clearly Vreid have decided not to continue down the V route, because latest album Welcome Farewell is a much more stripped-down attempt, mixing black, thrash and heavy metal into a solid set of songs that are mostly only progressive in subtle ways. You could hardly accuse the band of trying to mimic Enslaved here; opener The Ramble practically gallops along with thrashy riffs, kicking into a faster pace towards the end. It's deceptively straightforward, working the nuanced, varied riffage into the fabric of the song and ensuring the main effect is that of a unified band at their best. That's what to expect from this album, all in all. Songs are varied - the fast, pounding Way of the Serpent with its intricate and atmospheric melodic rumble leads into the more grooving and percussive The Devil's Hand, for example - but equally brilliant. The guitar intro to the title track is distinctly Death-like, there's hints of the old folk influences on The Reap with what sounds like a fiddle, and those wanting a ravaging, black-thrash assault or a return to the Enslaved-type sound will find both on Sights Of Old, which starts like Aura Noir and goes all prog on you partway through. And here, the band's progressive forays are undoubtedly successful, having taken the time to set the scene and blast you into submission, the ensuing melodic, wandering jam works perfectly. Fear not, fans of heavier Vreid, it's the only attempt on the album, the only eight-minuter in an album full of four to five minute crunchers - Vreid tend to have one long song surrounded by shorter ones on each full-length, and that formula is still working very well here. What I came away with, after multiple listens, was a real respect for Vreid. This is a classy, expert album, full of great songs that sound good from the first listen and only get better. It's not their best album - my favourite is still the heartfelt, fist-pumping rebelliousness of Milorg. But it is a damn good, more than solid, professional effort that will restore their places in the hearts of fans who may have felt that their heroes had taken a wrong turn on the career path. Welcome Farewell is a return to brilliant form, ultimately, and one that deserves your ears.